Recording in the DETEXI NVR is either schedule based or event based (triggered), and many recording options are available. Schedule based recording can be set up as continuous (24/7 or other schedule) with or without motion detection or triggered. An alarm-triggered recording can be activated by, for example, video motion detection or an external input through a camera’s input port. Scheduled recording can combine both continuous and triggered recording instructions (within schedule). Recording without Motion Detection — video is recorded constantly while on schedule, without motion analysis being done. Recording with Motion Detection — video is recorded constantly while on schedule, the video is analyzed and encoded with markers when motion is detected for faster and smarter replay. Recording on Motion Only — video is analyzed constantly while on schedule, but only recorded when motion is detected. Recording on Motion Alarm — video is analyzed constantly while on schedule; the alarm raises when motion is detected starting the alarm video recording and execution of assigned task. An assigned task must not include the Record Camera action because a video stream is already initiated. Recording on Input Alarm — the hard input(s) of the camera are monitored while on schedule; when an alarm is detected the execution of assigned task starts. Recording of alarm video occurs if only an assigned task includes the Record Camera action that initiates a video stream from the camera. Recording on NVR event (Record Camera action is included in an assigned task)— video is recorded for any defined camera when a chosen event occurs in the NVR. The NVR response configuration is based on the NVR Task Execution Engine. In the NVR a trigger is a set of criteria that, when met, starts the execution of assigned task. When an event is triggered, some of the common responses can occur, if configured. Recording occurs if assigned task includes the Record Camera action. Learning the NVR event management system should allow a better understanding of how to configure system settings including recording instructions. Before recording can occur an IP device (network camera or video encoder) must be defined in the NVR Control Center. Before setting up any type of recording ensure first that recording is enabled for the IP device. Turning on continuous recording requires at least one schedule to be added and configured for the IP device. Scheduled recording can combine both continuous and alarm-triggered recording instructions (within schedule). Recording can be triggered by any event in the NVR by including Record Camera action in the assigned task. If Recording on Input Alarm method is setup, the IP device inputs must be defined in the cameras settings for the NVR to be aware of external devices connected to the inputs and the Check Alarm service responsible for watching the status of IP device inputs should be running and monitored. When you are ready for your recording settings to take effect, start the Recorder and Check Drive services from the NVR Control Center — Monitor or if the services were running during the configuration just click the Synchronize button to activate the new configurations. Ensure that recording is enabled and switch to the Recording. For a PTZ camera setup initial position on starting the recording. For recording without motion detection on the Motion tab Motion detection checkbox should be unchecked (motion detection is set by default). Click Save button below the Schedule list to save continuous recording schedule. For setting up recording with motion detection continue to Setup Motion Detection. For setting up alarm-triggered recording continue to Setup Alarm-triggered Recording. Recording is enabled for the selected camera if the Exclude from recording checkbox is unchecked in the Camera Settings. Video quality settings apply only to the currently selected recording schedule, allowing different video quality to be applied to different situations. If Connect camera immediately checkbox in the NVR Control Center — General is checked the connection will be established immediately and the Connect/Stop toggle-button will not be available. 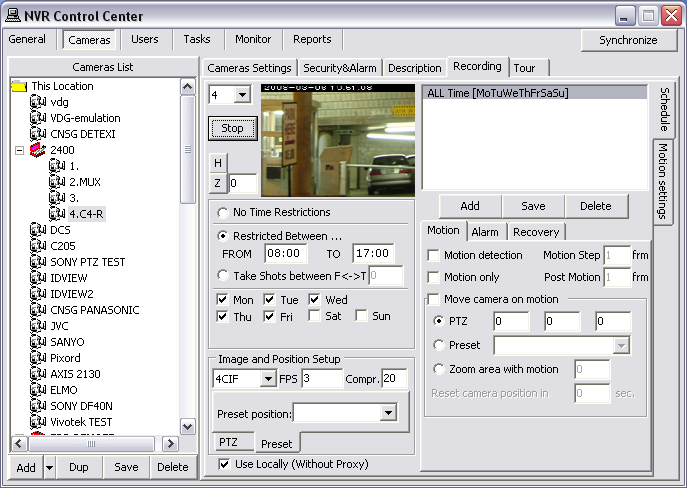 A PTZ camera preset positions are only available if the connection is established. Show Locally checkbox can be checked to connect to the camera using local IP address and port number (during configuration time only). The checkbox is only activated if camera has both an internal and external connections configured in the NVR Control Center — Cameras — Cameras Settings. Under the Image and Position Setup enter Pan, Tilt, Zoom parameters or select a preset position from Preset drop-down list. 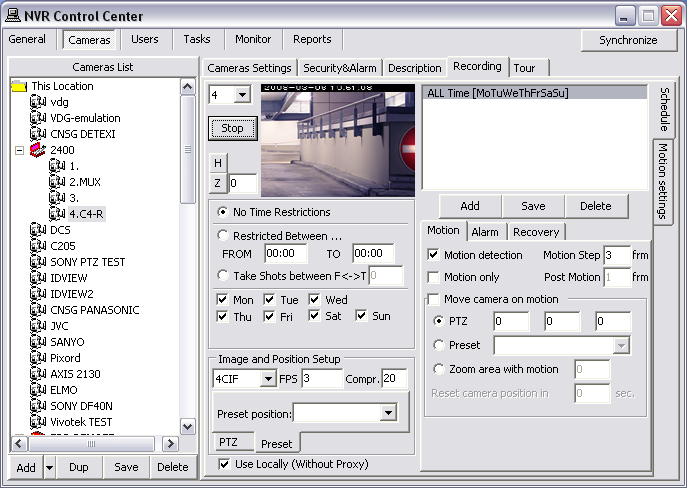 Getting PTZ values of the current camera position click on the Get PTZ button. Recording with motion detection — video is archived constantly while on schedule, the video is analyzed and encoded with markers when motion is detected for faster and smarter replay. Recording only on motion — video is analyzed constantly while on schedule, but only archived when motion is detected. Switch to the Motion tab. Set the Motion Step — the sample rate for motion analysis. With a motion step of 1, every frame will be analyzed. With a motion step of 3, every third frame will be analyzed and so on. If necessary, switch to the Motion Settings right side tab to adjust motion settings — roughness, sensitivity, region of interest (ROI) and return to the Schedule. Check the Motion only checkbox on the Motion tab. Set the Post Motion — number of frames to be recorded after the last motion was detected. Switch to the Alarm tab below the schedule list. Check the Alarm on Motion checkbox. Select an appropriate predefined task from the Execute task drop-down list below the checkbox. An assigned task must not include the Record Camera action because a video stream is already initiated. Enter a quantity of Pre Alarm and Post Alarm recording frames. Enter a Dwell time to prevent for this time an alarm recording from being interrupted by a new soft-alarm. 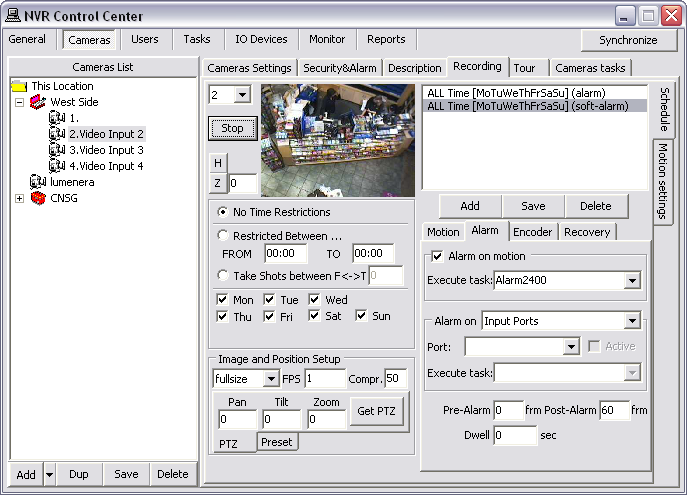 When motion is detected the alarm video recording starts even if the task to be executed hasn’t been assigned (Pre-Alarm + Post-Alarm number of frames specified). Select Input Ports from the Alarm on drop-down list. The on Events selection is for intelligent IVAS cameras only. Select an appropriate predefined task from the Execute task drop-down list below. Recording of alarm video occurs if only an assigned task includes the Record Camera action, that initiates a video stream from the camera. Enter a quantity of Post Alarm recording frames.